Promise Badu loves his work and loves to share it. Operator of Dogbeda Vormawu Kente Training Center in the Volta region of Ghana, the twenty-seven-year-old has a passion for teaching others. Promise has, in some ways, followed in the family footsteps. Raised in a single parent household, he lived with and learned from his father, a master kente weaver and founder of the kente center that Promise now operates. All throughout his formal education, Promise was also receiving instruction in kente weaving. “As a kid,” he says, “I use to stay with [my father] and watch him do it, and helped him after school and on vacations.” His father had little taste for academics and so struck a bargain with his son: he would pay for his school fees until he came of age if Promise worked with him in the kente center on school vacations. Even with assistance from his father, Promise sometimes found it difficult to gather the funds to pay for his fees and textbooks, and often went to school without money for lunch. Promise fought to finish his education, and succeeded, graduating from Agortime Senior High School. Promise long held a dream to empower the youth of his community, but without access to capital, struggled to see how it might come to fruition. After finishing up his time at Trinity Yard School and passing the baton of kente instruction on to his former pupil James, Promise returned to his hometown and began to develop a plan for growing the family kente center to accommodate such an effort. In April of 2015, Promise applied for his first Zidisha loan, one of the first major steps in his new and ambitious project. This first loan, for the small sum of $46.75, allowed Promise to repair several broken looms. Faithfully and efficiently repaying this loan, Promise established financial credibility with lenders. With his second loan, $93.50 funded in June of 2015 by three Zidisha lenders, Promise purchased colorful skeins of yarn. These first two loans helped Promise put “stuff in place” in the kente shop, developing capital and resources, building toward Promise’s long term goal of youth empowerment. Six months after this second loan, having repaid his lenders and spent the summer and fall building infrastructure and laying groundwork for a youth engagement and occupational training program, Promise again applied to Zidisha. This loan, a credit of $262 disbursed in January 2016, covered the start-up cost of employing three young members of Promise’s Ghanaian community. In the ten months since this second loan was received, Promise has fully repaid his lenders and his training program has grown considerably. An August 2016 loan of $348, the most recent sum to date, enabled the purchase of yarns, shuttles, bobbins, and other materials for weaving, as well as supplied the funds to hire two additional young employees. “These loans helped greatly in laying the foundation of the dream,” Promise says. At this time, the Dogbeda Vormawu Kente Training Center employs nine people. Three work on a full-time basis, two are in training, and four operate on contract. “Work normally starts at 7 AM,” Promise says, describing a typical day at Dogbeda. “You have everyone busy in their various looms, except those training may be assigned to other things.” Weavers take breaks as needed throughout the day, closing up shop around 5 PM, though sometimes special projects will keep them there until 8. With a name like Promise it is likely that this young man knows better than most the potential for ingenuity, for bright and productive futures, that young Ghanaians hold. He himself is an example of this promise; promise coming to fruition. Thanks to Promise’s effort and dreams, and financial support from Zidisha lenders, more young people will have the opportunity to fulfill their promise and see their communities grow and thrive. If you would like to assist another entrepreneur of promise, head over to our loans page and contribute to one of the loan applications posted there. Help a community thrive and a business grow. The whirr of a sewing machine fills the little room, the gentle noise softening the edges of the day. Aat Atikah sits at her table, using both hands to guide a strip of fabric beneath the needle as it bobs. She settles into the familiar, soothing rhythm of sewing. She blinks, her eyes keeping up with flash of thread through a pattern of flowers. This is going to be a beautiful dress. Aat Atikah, called Atik by her friends, family, and lenders, is a wife, mother, and designer in Bogor, Indonesia. Age 38, Atik has three children. The oldest, a son, is 21 years old and lives elsewhere in their island nation. The two younger daughters, ages 15 and 1, live at home with their mother and father. Since the birth of her first child, Atik has been a stay-at-home mother, leaving her eight-year job as a tailor in a garment factory upon confirmation of her pregnancy. As a young woman, Atik says, “I had a lot of dreams that I wanted to achieve.” She had big plans to build a clothing empire. “I wanted to be a woman entrepreneur who has a large industrial garment factory,” she said. She wanted to “Provide jobs for the needy… Help my beloved family’s economic welfare.” When Atik became a mother, however, she put that dream on hold. Spending her days in the role of what Atik terms a “normal housewife,” Atik has provided for the needs of her family physically, emotionally, and mentally. As her children grew older, Atik began to have some free time. With her entrepreneurial spirit firmly intact, she took up sewing for neighbors and relatives. As word of her excellent tailoring work spread, Atik began to receive requests from people she did not even know. Atik had, inadvertently, launched a small tailoring service. This business grew, and allowed her to provide a supplemental income to increase her family’s economic welfare. Presently, Atik is able to accept and fill one order a day. She alters pants, makes shirts, and designs dresses. You name it, she sews it. With customers paying an average of $2 to $10, depending on the complexity of the order, Atik brings in $14 to $70 per week. As her husband is the family’s primary breadwinner, Atik is able to contribute to the family’s funds while also putting some money away for future investments. Currently, Atik says, “I have only one dream. I just want to be happy with my lovely family.” Familial happiness and entrepreneurship need not be mutually exclusive, though, and this is something she well knows. With her skills and expertise lying in the realm of fashion, Atik is well prepared for a venture into clothing and textiles. The dreams of her youth are coming back to life, coming off hold. “I really want to have a bigger, industrial clothing production and employ many employees,” she said in her January 2016 application for a $50 loan. “But I know it cannot be achieved easily, cannot be instant. There must be a process that I go through to achieve success. Therefore, at this time, I would like to start from zero.” Her zero is what she calls her “little tailor shop,” the table in her home where she slides her seams beneath the whirring needle of the sewing machine. With her first loan, Atik purchased a stock of fabric, and that fabric turned into profit. As Atik has said, there is much hard work ahead of her. With help, however, from Zidisha lenders, she has come several steps closer to reaching her goals. Hard work and determination can take a person far, and with a little help from friends around the world, anything is possible. If you would like to make something possible for an entrepreneur, head over to our loans page and contribute to the project of another self-starter like Atik. Here is a great update from Dan in Kenya! 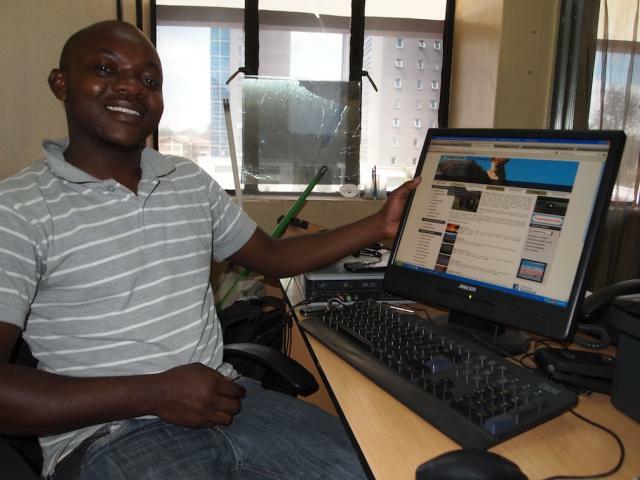 Hello, my name is Dan Cembrola, one of Zidisha’s Kenya Client Relationship Managers. I am currently visiting Zidisha borrowers in Nakuru and its outskirts. Today I visited with Keziah at her store in the center of Nakuru. This store is one of her two businesses. In Nakuru, you will find many stalls lining the streets selling secondhand clothing. There are a few upscale stores that sell clothes for formal occasions and many local tailors who make custom made clothing, mostly for women and children. Outside of these two clothing options, most people purchase clothing from the street vendors. Keziah supplies these vendors. 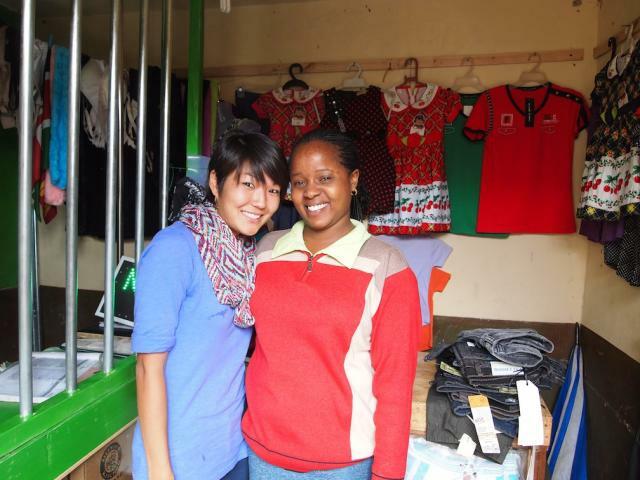 Keziah, or her business partner and hopefully future Zidisha borrower Elizabeth, regularly travel to Nairobi to purchase bales of clothing. These bales are about three and a half feet wide and two feet in height, tightly packed with clothing. Keziah is not able to open the bales and inspect the clothing, they are sold as is. Similarly, after Keziah transports the bales back to Nakuru she sells them to the local vendors as is. Each bale costs about $75-$100 for Keziah to buy in Nairobi and she is able to resell them for $175-$220 in Nakuru. It only costs $2 to transport a bale from Nairobi to Nakuru, so Keziah is able to make a tidy profit on each one. When walking the streets of Nakuru, it is not uncommon to see people walking around wearing American football jerseys from the 1990’s, tee shirts promoting small town American restaurants, and obscure US politicians. Obviously, these items of clothing were donated to various NGOs in America by people intending for their donations to be given free of charge to people in the developing world. In actuality, these items of clothing are shipped to Mombasa, they are then purchased by wholesalers in Nairobi, sold to people like Keziah in the clothing business, who then sells them to local vendors, finally the local vendors sell them to the townspeople who were initially intended to receive them for free. The secondhand clothing business in Kenya is immense. Prior to my meeting with Keziah, she was completely unaware that the clothing she was selling was actually intended to be donated to people in need. The vast majority of clothing vendors are equally unaware. Regardless of the fact that these clothes were intended to be donated, it is probably best that this secondhand clothing business exists. It provides an income for tens, if not hundreds, of thousands of people. In addition to her clothing business, Keziah’s second business, which she describes as her main focus and passion, is cosmetics. For the past three years, Keziah has been selling cosmetic items, including every type of make up imaginable as well as weaves and human hair wigs. All of these items are very popular among women in the urban center of Nakuru. Because of this, it is difficult to find a street that does not have a salon or cosmetics store. Due to the high level of competition in Nakuru, Keziah travels to the surrounding villages to sell her wares. She has developed a loyal customer base in the areas surrounding Nakuru. With her first loan, Keziah increased her supply of cosmetics and human hair wigs, which is a highly profitable item. Keziah is also adept at applying make up, weaves, and wigs. In the future, she envisions using her next loan and the profits of her two businesses to purchase a cosmetics store in Nakuru. Though competition is high in town, Keziah has many loyal customers from the surrounding villages and towns. 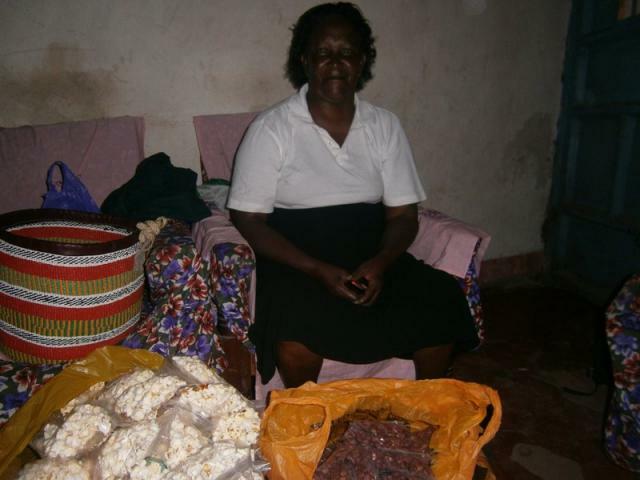 Currently, her customers outside of Nakuru are only able to purchase her products when she is visiting their village. Since Keziah is often traveling, she wishes to have a permanent store in Nakuru where she would employ someone full time. Keziah believes, correctly, that this will allow her to travel and continue to expand her customer base while allowing her current customers to purchase cosmetics at their lesiure from her store. Keziah is a very motivated young woman and has a sharp mind for business and her future is bright. Here is a great update from Traci in Kenya! Hello, my name is Traci Yoshiyama, Zidisha’s Kenya Client Relationship Manager. I am currently visiting Zidisha borrowers in and around Nairobi. Look good to feel good, a universal approach to life amongst women everywhere in the world, Kenya being no different. Salons and boutiques ubiquitously line the streets of every town, big or small. Heaps of secondhand clothing can be found on the busy downtown sidewalks of Nairobi, women picking through the piles to find that special piece to add to their wardrobe. And formal dress is not only set aside for Sunday’s best, but every day men and women, the rich and poor, can be seen sporting the latest fashion trends. 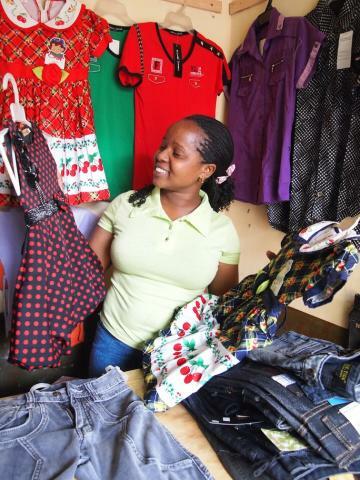 With clothes being an easy, affordable, and high-demand commodity, many women, including Zidisha borrower Judy Mburu, decide to venture into the clothing business. After leaving her job with EPZ, Judy began her new career as a hawker, selling shoes around the town of Githunguri. Proving to be a success, she soon earned enough money to rent a space constructed out of iron sheets along the side of the main road, neighboring produce stands and similar boutiques (see profile picture). Progressing even further, Judy introduced secondhand clothes, called mitumba, to her stock. For two years her business grew, allowing Judy to put food on the table for her family (two young boys), pay rent, employ a woman to upkeep her home during her long 13-hour workdays, and chip in for a security guard to watch over the shops in the evening. Always looking to expand, Judy became a Zidisha member in November, receiving her loan shortly after. Thanks to Judy’s astute business skills and the help of Zidisha, she no longer has an iron sheet shop, but now rents a permanent room. Furthermore, with her Zidisha loan, Judy was able to become an M-PESA agent, dedicating half of her shop to M-PESA matters. A similar approach to strategically placing knick-knacks along checkout counters, Judy’s M-PESA customers will inevitably browse her clothing shop. No longer selling mitumba, due to an increase in import taxes, she now offers new clothes for all ages. Obviously not a one trick pony, Judy also sells popcorn outside her shop, though due to the day’s downpour, her machine could not be set up. Wanting to pay back her loan earlier than expected, Judy would like to use her second loan to buy more clothes and add hair accessories. She would also like to move to a larger space, preferably back to the main road, which draws a lot of foot traffic. After only two years, it is hard to imagine that this all started with a portable shoe business. But after meeting Judy and witnessing her conviction to succeed, it all makes perfect sense. Being in Githunguri often, I look forward to greeting Judy at her future shop along the main road. Asante sana Judy, kwa tembelea mzuri! Here is a brand new update from one of our client relationship interns in Kenya! Be sure to check out the borrower’s profile for more information and leave any questions that you may have in the comments below! Hello, my name is Andrew Weber and I am currently a Client Relationship Manager visiting Zidisha borrowers all over Kenya. It is quite common in Kenya to see people selling small bags of popcorn or peanuts. These ubiquitous little treats are sold by everyone from shop owners to wandering food merchants tapping on your window as you wait for your bus to depart. While the roaming vendors hawking various products are often ignored by weary Kenyans as they wait at the bus station, I’ve seen locals perk up many times to purchase a snack from a popcorn and peanut seller. Irene understands Kenyans’ craving for salty snacks, and has in turn made herself into the Popcorn Lady of Naivasha. Irene’s popcorn and peanut empire covers more than 100 vendors and shops in the region. She has the largest network of customers in the area. Rather than join the hordes of snack retailers in the area, Irene opted to enter the distribution business in 2003. 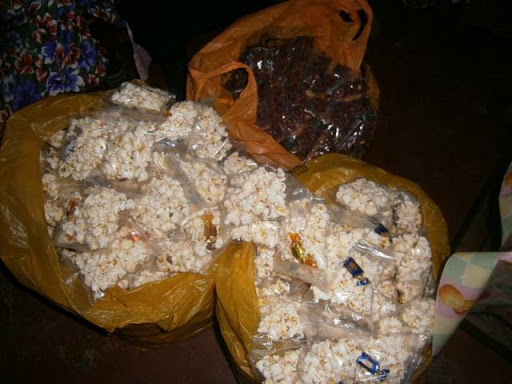 She procures large sacs of popcorn and peanuts directly from a food wholesaler in Nairobi. The massive bulk of her individual purchases speak to the volume of snacks she pushes through the area: 90 kg (200lbs.) sacs of peanuts and multiple 10kg (22lbs.) sacs of popcorn. She then cooks the products herself before having them bagged and then selling them near and far. Customers include traders who come to her to bring snacks back to their more rural villages, and also shops all over the region. “Shops buy from me because I know how to cook”, says Irene. She cooks the peanuts in salt and water with no oil. With her loan Irene has increased her supply greatly, and moving the greater bulk has not been a problem at all for her. Wedding season is coming up so she hopes to continue moving an increased supply. The increased profits help support her six children, a couple of which are studying at universities. She is also still hoping to use part of the loan to buy a large popcorn machine, which will enable more quickly churn out her product so she can continue to grow her business. The machines are quite pricey though, so that purchase might have to wait until Zidisha loan number two. Once she has a large popcorn machine, her snack empire may begin to reach all corners of the nation. “Life in Kenya is hard.” I hear this statement often, though never as a complaint, but merely said with matter-of-factness. And although this is true for many, it is hardly a deterrence to persevere. But while the entrepreneurial spirit soars in Kenya, this unbridled enthusiasm comes with many challenges. Families struggle due to lack of business know-how and financial management skills and risk of unavoidable circumstances are high. To be a successful entrepreneur anywhere in the world takes not only passion, but also careful planning. Today I met a true entrepreneur in every sense of the word, Zidisha borrower John Maina, who turned a life that presented many obstacles into something of a success story. Despite being orphaned at the age of three, losing his sponsor during his first year of high school, and having the responsibility of supporting his siblings with wages made from a janitorial position, John became the founder of the rapidly growing tour company, Topman Safaris and Travel. Although only operating for four months, Topman Safaris has already accomplished so much. Through diligent web marketing, John has spread the word about Topman, receiving clients from all over the world, including places like Turkey, Oman, India, and Spain. He has even partnered with several tour companies in Tanzania, Zanzibar, and Seychelles, expanding his tours beyond Kenya. Never tiring of visiting the picturesque sites of Kenya, John has already made over twenty trips to the Maasai Mara. Proven to be a profitable business thus far, John has been able to start a salon for his wife and also purchase a plot of land. Like any good businessman, John is constantly searching for innovative ways to expand his company. Growing up amongst the exotic flora and fauna of Mount Kenya, he witnessed the destruction of wildlife on a daily basis, at the time not understanding the importance of ecological conservation. It is because of this exposure that John would like to turn Topman Safaris and Travel into an ecotourism operator. Coming December he will do just that. In addition to becoming an eco-friendly company, John became a Zidisha member. With his loan, he would like to continue to renovate his office, making it more aesthetically pleasing and professional for his clients. Currently having to rent a vehicle for safari excursions, John would also like to purchase his own van, allowing him to save thousands of shillings each month. With a bit of savings, he is also planning on attending the ITB Berlin in March, the world’s largest travel and tourism trade fair. Seeking opportunities every which way, John is an inspiration to those wanting to improve their lives through entrepreneurship. I am happy to see that Zidisha is one mechanism that can assist him with his endeavors. Planning a trip to Kenya? Visit John’s website at http://topmansafaris.com.